A Russian-built Earth observation satellite designed to provide reconnaissance imagery to Egyptian military officials is ready for launch Thursday from the Baikonur Cosmodrome in Kazakhstan on top of a Soyuz rocket. The EgyptSat-A spacecraft and its Soyuz 2-1.b booster arrived at the Complex 31 launch pad Monday at Baikonur on the sprawling steppes of Kazakhstan. Hydraulic lifts hoisted the rocket vertical at the launch pad, and gantry arms rotated around the launcher for workers to complete final preflight preparations. Thursday’s mission will mark Russia’s first space mission of the year, hauling a satellite to orbit for Egypt to replace the EgyptSat 2 Earth-imaging satellite, which failed in orbit in 2015, one year into a planned 11-year mission. Built by RSC Energia, a Moscow-based aerospace contractor, the EgyptSat-A satellite was manufactured with money from an insurance payout from the loss of EgyptSat 2, according to Russia’s Tass news agency. Russian news reports said the development of EgyptSat-A cost approximately $100 million. The satellite weighs more than a ton fully fueled, and Tass reported EgyptSat-A features several improvements over the EgyptSat 2 design, including improved solar batteries and a high-speed radio link with ground stations. The spacecraft’s electro-optical imaging system includes an Earth-viewing telescope and camera that can spot surface features as small as 3.3 feet (1 meter), with similar capabilities as the failed EgyptSat 2 satellite. EgyptSat-A is the third Egyptian Earth observation satellite built in Russia, following the EgyptSat 1 spacecraft launched in 2007 and EgyptSat 2 launched in 2014. Like its predecessor, EgyptSat-A is owned by Egypt’s National Authority for Remote Sensing and Space Sciences, a government agency tasked with gathering and studying satellite imagery of the Earth. Primary users of EgyptSat-A’s imagery are expected to include Egyptian military and security forces, intelligence analysts, emergency responders, environmental monitoring experts, and the agricultural sector. 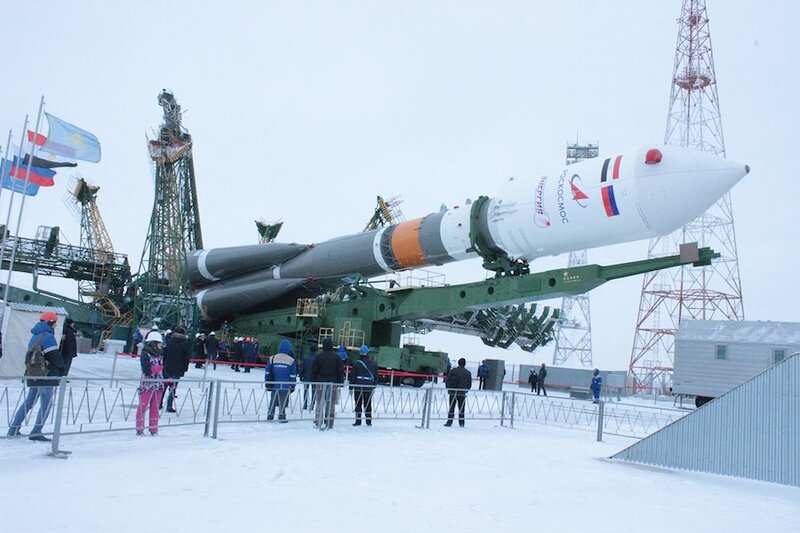 EgyptSat-A is set for liftoff aboard a Soyuz-2.1b rocket at 1647 GMT (11:47 a.m. EST) Thursday. Russia’s space agency, Roscosmos, plans to provide a live webcast of the launch, which will be available on this page. The launch is timed for 9:47 p.m. local time at the Baikonur launch base, a facility leased from Kazakhstan by the Russian government. Local authorities in Kazakhstan adjusted the Baikonur time zone one hour earlier in December, making the local time now two hours ahead of Moscow. The three-stage Soyuz booster will head north from Baikonur after liftoff, releasing its four first stage boosters to fall to Earth around two minutes into the flight. The core stage, also known as the second stage, will fire its engine for nearly five minutes, then separate as the third stage’s RD-0124 engine ignites to send the EgyptSat-A spacecraft and its Fregat upper stage toward orbit. The Fregat upper stage will deploy from the Soyuz third stage around nine minutes into the mission, then begin maneuvers to place EgyptSat-A into its planned polar orbit. Russian engineers will hand over control EgyptSat-A to Egyptian officials after the conclusion in in-orbit checkouts, according to Energia.